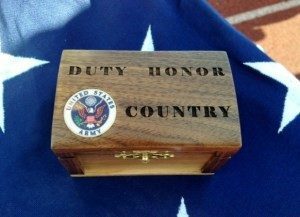 Public law, Title 10, United States Code, section 1491, provides that all veterans who served their country in military service under conditions not dishonorable are entitled to military funeral honors. The Department of Defense and the Veteran’s Administration have authorized veteran’s organizations such as the VFW, American Legion and Marine Corp League to conduct military funeral honors at a veteran’s funeral services. The VFW Post 3232 Honor Guard provides military honors at all veteran funerals, memorial services and celebrations of life, as requested by the families. The ceremony exemplifies the “ceremonial paying of respect and the final demonstration of the country’s gratitude to those who, in times of war and peace, have faithfully defended our nation” and includes a 3 rifle volley, the sounding of Taps, and the ceremonial folding and presenting the nation’s flag with 3 expended rounds, signifying the deceased veterans sacrifice to Duty, Honor and Country, to the family of the deceased. The VFW Post 3232 Honor Guard volunteers are distinguished by their black and white uniforms with black braids and black ascots. While we do not charge for these services, we do accept donations, the proceeds of which go to the support of our fellow veterans, family and the community. The Post 3232 Honor Guard stands ready to perform our last duty in conveying our gratitude and paying our final respects to a fallen comrade. If our services are needed please contact us and we will be honored to support you. The Veterans of Foreign Wars Florence Post 3232 Color Guard is very proud of its service in presenting and display our nation’s colors and associated unit flags at patriotic events and meeting. The Color Guard is comprised of volunteer members of VFW Florence Post 3232. They participates in many parades, events, and ceremonies honoring current active duty service members, veterans and fallen comrades. We take great pride in what we do and are very pleased to have been selected as the VFW State Honor Guard for the past three years.